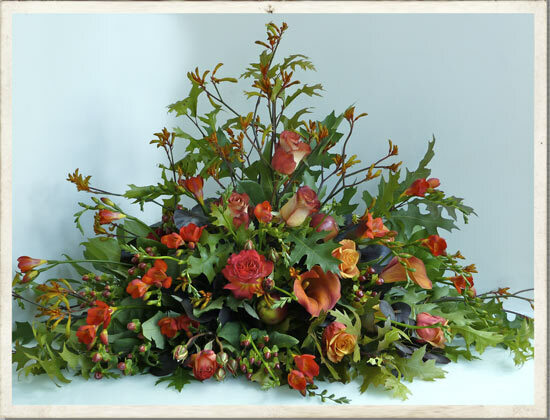 Cath and James were married in September and made the most of the beautiful autumn colours in her seasonal wedding flowers. 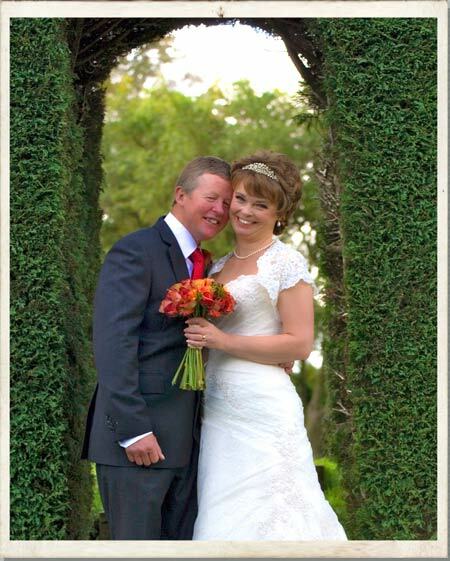 Thanks for the above photo to Alison at Lemon Photography. 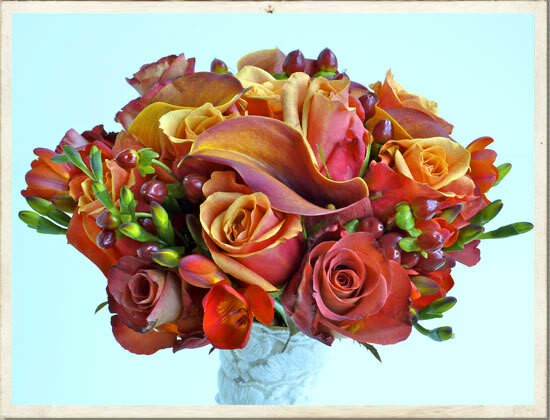 "My bouquet was exactly what I wanted, the colours were stunning.....Catherine was a delight to work with and we would highly recommend her to any couple requiring a florist to provide them with fantastic wedding flowers"
Cath wanted autumnal richness in her bridal bouquet so it was filled with rich red "Mango" calla lilies, gold and flame orange "Cherry Brandy" roses and sweet scented red freesias, "Dolly Parton" hypericum, with a hint of green provided by the freesia buds. The stems were wrapped in an antique lace with pretty pearl pins to match Cath's wedding dress. 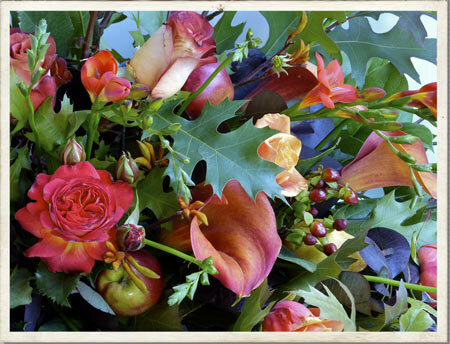 Her autumn colour theme continued with her bridesmaid's bouquet of similar rich seasonal flowers. 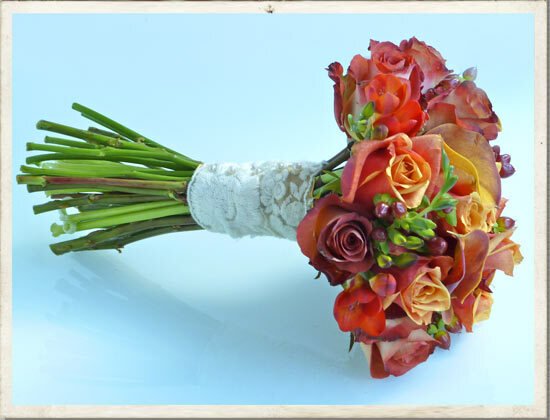 The stems, in this instance were wrapped in an autumnal orange silk ribbon, fastened with pearl-headed pins. 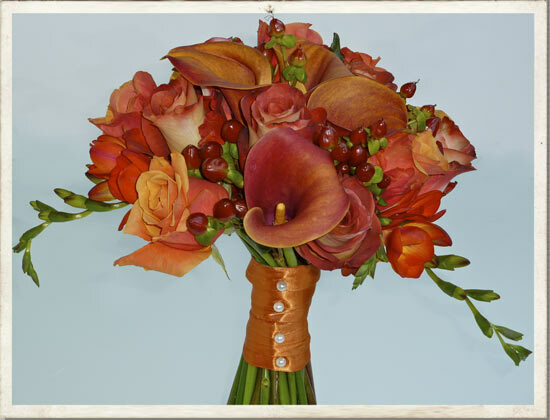 The buttonholes were made very different by the use of two different designs - one using the unusual autumn coloured calla lilies and the other using the rich gold and orange roses. There was also a wrist corsage featuring the same flowers fastened to a white silk ribbon. The registrar's table arrangement had great impact with its stunning autumn colour, perfectly complementing the wedding flowers theme. Additional autumnal flavour was provided by glossy apples and berries set off by the russet and green oak leaves. and we will get back in touch as straight away. We're here to help you.